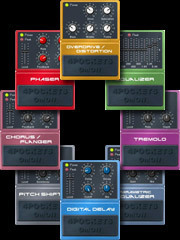 StompBox, Virtual effect for iPhone / iPod Touch / iPad from 4Pockets Audio. StompBox turns your iPad into aigital effects unit, with chromatic guitar tuner, metronome and recording tools. It allows you to chain up to 12 effects in any order and then save your settings as patch files that can be recalled at the press of a button. More info about their other apps on www.4pockets.com. 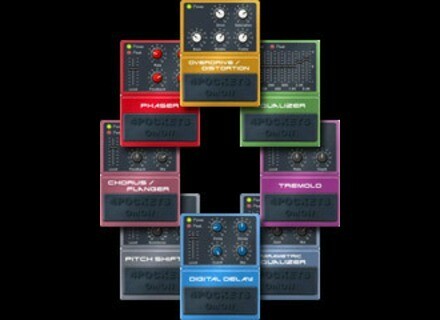 Twisted Tools Buffeater TwistedTools have announced the release of Buffeater, a real-time, dynamically ordered, granular multi-effect for all versions of Reaktor 5.
whiteLABEL Bolsterisers - Naive Dynamics Plugins The bolsterisers hark from a time before compression as we now know it. A long-obscure English experimentalist engineer and gentleman scientist by the name of Edwin Pierfax III derived his naive design of the original bolsteriser during a nap on the lawn with his cat Tiswold. Producer Loops Diginoiz for Free ProducerLoops.com in collaboration with sample manufacturer Diginoiz presents 'Diginoiz For Free', a free sample pack that can be downloaded as part of a paid order and features 6 construction kits in Urban styles, in 1GB of multi-format content.